This book offers refreshingly concise advice on how to make great rock & pop recordings on a budget. Recommended to me by SOS contributor Hannes Bieger, this eBook is, as its full title (The Alternative Workbook — Or How To Pimp Your Practice Room) suggests, aimed squarely at those who are trying to press less-than-ideal spaces into service as recording venues, and those who want to make superb recordings without access to the vast budgets we all wish we had! So, while pretty much all of the techniques described are applicable in any pop/rock recording context, a useful focus is retained on the techniques which are likely to make the greatest impact in sub-optimal rooms. The author, Moses Schneider, is a German recording engineer/producer who has worked on both sides of the Atlantic. His fame is probably greater in his native Germany, but he has some high-profile admirers — and sonically his results speak for themselves. You needn't take my word for it, though, because this eBook (which comes in Apple Books format and is available via the iStore, making it readable on iOS and OSX devices, as well as the ubiquitous PDF) is littered with short, high-quality and very useful audio clips, which are placed in line with the techniques being described. They demonstrate the various stages of a technique, as different mics are added into the mix, and they also show the different results obtained by choosing alternative mics for the same job, as well as what happens when you process the sounds in the context of other sources. One of the diagrams from The Alternative Workbook, in which the ORTF technique is depicted.Starting with the obvious, yet often overlooked, necessity of arranging the room to create a suitable recording atmosphere, and placing a heavy emphasis on making the conditions right for the band, the techniques advocated mostly revolve around tracking bands playing together live, even if vocals and certain elements are to be overdubbed. Schneider seems to appreciate the art of working with spill to create vibe — not least when it comes to the description of his 'Wurst' ('Sausage') technique. 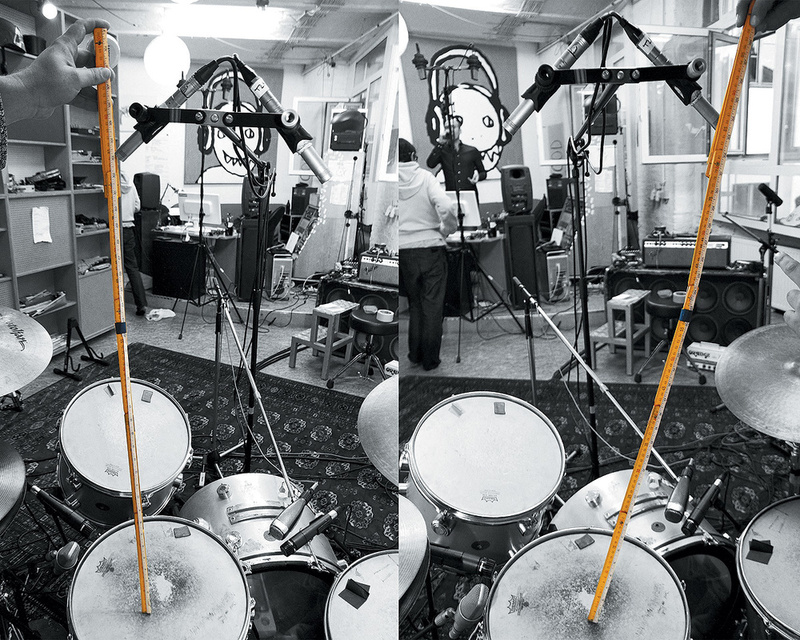 This is essentially a mono or double mic setup used as a very close overhead, the intention being to crush it to hell with compressors and gates and blend it in with more well-known 'few-mic' configurations, such as those used in the 'Glyn Johns' and 'Recorderman' drum-recording techniques. All techniques are helpfully illustrated with photographs or diagrams, and deliberate use of contrast means that they convey the intended point very well — as with the yellow tape measure and coloured mics being set against a studio/instrument background that's been rendered black and white; or the clear hand-drawn diagrams in simple black, white and red. This being an eBook, you can also zoom in on the pictures. The book was originally written in German, and my single criticism is the standard of the translation, which meant that I found myself re-reading a few sections in order to ensure I'd understood the author's meaning. Perhaps that's understandable, as this is not an expensive book — but were they to put this into print, I'd hope for a better standard of English. Despite this, I soon got used to the style, and the refreshingly high ratio of audio examples and photographs to text means that it's possible to pick up a lot quickly.